People are using satellite images like this one to search for the missing Malaysian Jetliner, which disappeared on March 7. Image uploaded March 14, 2014. 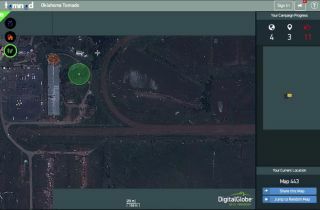 Earlier this week, Earth-imaging satellite company DigitalGlobe announced it was activating its crowdsourcing platform on Tomnod to enlist civilians in the search for the lost Malaysian jetliner. But then the site crashed from too many people logging in. Now the site is back up and you can sign up simply by entering your email and then join in the search. I logged in first using Chrome but after waiting several minutes for the map to load, I switched to Safari. The satellite images of the ocean are mainly black and dotted with wisps of white caps. Almost right away, I stumbled on something clearly manmade and I suspect it was a cargo ship. So I used the “other” icon and clicked on the ship. Unfortunately, the website did not put a little red or green halo around the object, which confirms that the object was recorded. But the click did add a number to the tally in the upper right under Your Campaign Progress. Why Are We Still Looking For A Black Box?! You can’t zoom in or zoom out and so it’s unclear what part of the ocean you’re actually searching. That makes the process a little disorienting. But if you have a few minutes to spare and want to join in the help, it’s relative easy to mow a few neat rows through the map. Start here and good luck.